The sun is burning through the remnants of the morning fog when a yellow school bus emblazoned with Transylvania County Boys and Girls Club pulls across a gravel parking lot in DuPont State Forest. Within seconds of coming to a halt, excited kids stream out of the bus and instantly head toward an assortment of bikes lying in wait. Hardly a minute passes before the group of 15 kids, most of whom are about 12 years old, have strapped on their helmets and are furiously pedaling around the lot. Their excitement is genuine and unabashed as they circle, talking amongst themselves about which trails they want to ride today as they prepare to head up the gravel roads and dirt paths into the forest. Not only does this program provide opportunities for kids to get out into nature and improve their physical health, one of the purposes is to also boost participants’ mental well-being. Another positive aspect is the rides give participants the chance to strike up friendships through the common pursuit and build relationships centered around a healthy activity. Many of the kids Janes works with don’t have an abundance of positive role models in their lives. He and the volunteer ride leaders try to help fill that void. Based on the Trips For Kids model established 25 years ago in San Francisco, the local branch is quickly growing into an organization that can make a big impact on the paths participants take in life. With humidity levels near 100 percent, it’s easy to tire quickly while pedaling up a steep gravel road through the forest. But Samantha Mann, on her fourth group ride of the summer, seems indefatigable. “It’s really fun because you get to come out and get exercise while hanging out with your friends,” she says. For Marcus Morgan, the program has opened his eyes to a whole new world of possibilities and shown him success is achievable through perseverance. When he started the program, he’d never ridden a bike without training wheels. 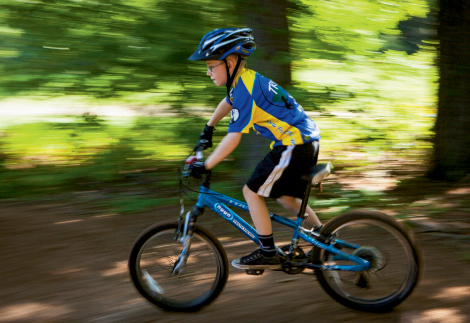 But, with the help of a coach at the Boys and Girls Club and steady encouragement, now, just weeks after learning to ride, he’s cranking his way uphill through moderately technical terrain. In the last two weeks, 12-year-old Morgan has gone on two rides and says he’s caught the mountain biking fever. The next step is to get his own bike so he can continue to ride. It’s kids like Morgan who have inspired Jane’s next endeavor. With hundreds of new riders, many of whom don’t have the resources to purchase a new bicycle, he plans to open a bike shop specializing in repairs of older models, which he’ll sell or donate to those who need them most. To launch the shop in Asheville’s Oakley neighborhood, Janes is asking for the community’s continued support through funding and volunteers who can teach bike maintenance and help handle sales at the store. “It really takes a whole community to do it right,” he says. For more information about how to volunteer or support Trips For Kids, call Janes at (828) 777-1022, or visit www.tripsforkidswnc.com.